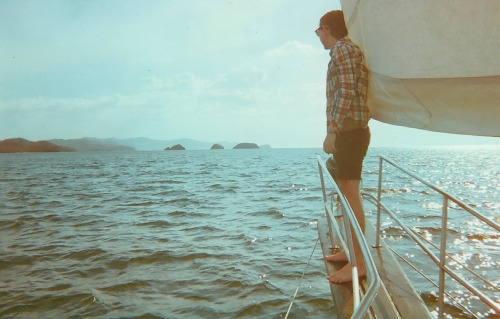 This photo was shot using a Kodak disposable camera in Costa Rica during spring break. Forget all the historic connotations that exist that should be required in an elementary understanding of punk music and it’s role in society. In the end, all it really stands for is youth and aggression. On Sunday night at Rubber Gloves Rehearsal Studios, Iceage didn’t give the audience even a chance to breathe, let alone question what they were experiencing and where it was coming from. Their 22 minute pummeling was punctuated in between songs only with ear splitting feedback from guitarist Johan Wieth’s amp (which funnily enough was a notoriously clean Roland JC-120, but more on contrasting image later…) Wieth, vocalist Elias Bender, bassist Jakob Pless, and drummer Dan Kjær Nielsen could care less about all sorts of technical issues the entire night, because they were irrelevant. The theme for Iceage is volume, punch, and simplicity and it was wildly effective and contrastive to openers Midnight Society and Marriage Material, who opt for a more washed out/electronic approach. The only words in between each song were the song titles yelled indecipherable over piercing feedback that would suddenly disappear into a wall of power after every stick count off. The band jumped off the stage ending their show a good 30 seconds before the audience even caught on it was over, still in shock. While Iceage gave no opportunity during their performance for any thought whatsoever due to it’s sheer raw power, the time spent in the venue watching the band mill about among the crowd was entertainment in itself. Iceage, whose members are in the 18-19 age range, look no older than 14-15 in real life. Their almost matching black jeans, tucked in tees, and Adidas shoes really added to their youthfulness. Their look, quietly reserved attitude, and politeness in making sure to watch every single local opening act made me question whether or not it was perpetuated purposefully to push the youth factor that has surrounded their recent buzz. Can kids this young even get the complicated punk history they are seamlessly blending together? Once the band finished their first song and the piercing feedback that would never let up started, none of the preconceptions mattered whatsoever. The music was real and so was the aggression, and that’s all that punk is supposed to be. Some kids are just smart and there’s no time to wink when pummeling an entire crowd.